Prototype: German Federal Railroad (DB) class 191. Rebuilt version with small lamps and a chrome oxide green paint scheme. The locomotive looks as it did around 1970. Model: The locomotive has an mfx digital decoder and a locomotive whistle sound that can be turned on and off. It also has controlled high-efficiency propulsion. 3 axles powered. Traction tires. The engine room has interior details. 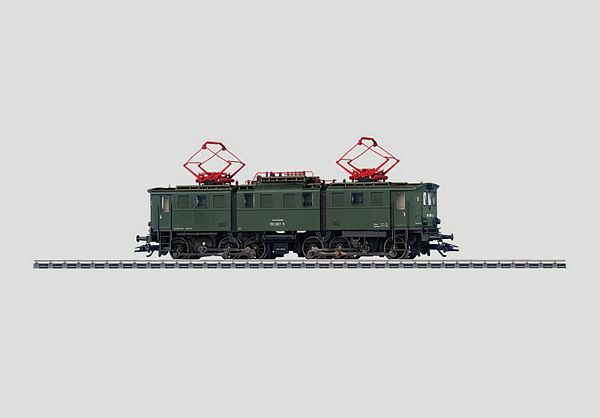 The locomotive has separately applied grab irons and roof walk boards. The triple headlights change over with the direction of travel, will work in conventional operation, and can be controlled digitally. Length over the buffers 19.9 cm / 7-7/8.